Nowhere is the old adage "be careful what you wish for because you might just get it" more true than in Sweden's Elitserien. At the end of the regular season, playoff matchups are not simply determined by the standings. Instead, the head coaches of the top three teams in the regular season get the opportunity in a nationally televised ceremony to select their opponent in the first round of the playoffs. The fourth-seeded team plays whichever team is left. The selection process creates massive pressure on the top-seeded team. There is considerable potential for embarrassment and second-guessing if the first-place team's hand-picked opponent upsets them in the quarterfinals. In order to deflect the pressure, the coach of the team making the first selection inevitably explains that there no easy matchups anymore and effusively praises the talents of the selected opponent. Last year, HV 71 Jönköping entered the playoffs as the prohibitive title favorite. Not only were they the defending champions, but they overcame early injury woes to capture first place in the regular season. No one was surprised when the team selected AIK Stockholm as its quarterfinal opponent. AIK had barely squeaked into the postseason on the final day and was in its first season in the Elites after an absence of nearly a decade. What happened next was arguably the most shocking early playoff outcome since Elitserien was created in 1975. 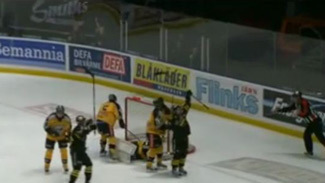 Not only did AIK beat HV 71, they did it in a sweep. AIK's late-blooming star goaltender, Viktor Fasth, was virtually unbeatable and he held the highest-scoring team in the league to just four goals for the entire series. This year, Luleå HF comfortably finished first during the regular season. They did so primarily with a stifling defense that allowed just 104 goals (1.89 per game) during the 55-game regular season. When the time came to select their first-round playoff opponent, most pundits expected LHF coach Jonas Rönnqvist to choose eighth-place Modo Hockey Örnsköldsvik. Instead, he went for seventh-place AIK. Rönnqvist's rationale for the selection was that his club had handled AIK effectively during the regular season, winning four of five games and recording shutouts in each of the victories. Meanwhile, Luleå had dropped three of five against Modo, and had seen Ulf Samuelsson's team break through to produce three or more goals in each of their wins. "It is an extremely difficult pick," Rönnqvist said immediately after the selection was made on the Canal+ network. "I think our club matches up a little better against AIK. But they are a good team, and we expect a tough series." The second-guessing of the AIK selection began immediately throughout the Swedish press. Commentators noted that AIK's top scoring line -- anchored by league-leading scorer Robert Rosen (21 goals, 60 points) and the circuit's top goal scorer Richard Gynge (28 goals) -- had been stymied by Luleå during the regular season. Nevertheless, given Fasth's propensity for stealing games, the historic difficulties of going into AIK's legendary Hovet home rink and the number of potentially dangerous supporting cast performers on AIK, the team from Stockholm figured to be a handful. Luleå was favored to win, but was not nearly the overwhelming pre-series favorite HV 71 was last year. National television commentator Mikael Renberg, who spent most of the European portion of his long playing career as a member of LHF before finishing with Skellefteå AIK, was among the most vocal critics of Ronnqvist's choice of opponents. "I think Luleå should have chosen Modo instead of AIK," he said after second-place Skellefteå picked Modo as its opponent. "The playoffs are different from the regular season, and I think AIK is a little better built for the playoffs, especially with Fasth in goal." In the first game of the series, AIK gave home team Luleå all it could handle. The visiting team jumped out to leads of 1-0 and 2-1 before the home side evened things up shortly before the end of the second period. Luleå came on strong in the third period, grabbing the lead early, adding a power-play goal to build a two-goal cushion and then tacking on a pair of empty-net goals en route to a 6-3 victory. There was a palpable sense of relief on the Luleå side after the Game 1 comeback victory. As it turned out, the favored team relaxed prematurely. With the series moving to Johanneshov on the Stockholm outskirts for Game 2, LHF's Toni Koivisto gave his club the early lead with his second goal in as many games. But AIK roared back for three unanswered goal in the middle period, and forged an insurmountable 4-1 advantage midway through the third. Fasth (28 saves) held the score right there until LHF scored a meaningless goal on a power play in the final half minute to make it a 4-2 final. The real turning point of the series was Game 3 in Luleå's Coop Arena. After a scoreless first period, the game remained a 0-0 deadlock as it passed the halfway point of regulation. Suddenly and unexpectedly, AIK exploded for three goals -- one power-play, one even-strength and a backbreaking shorthanded marker by Daniel Bang -- in a span of 3:43. Luleå stopped the bleeding and eventually cut the huge deficit down to a single goal, but Fasth (34 saves) and company slammed the door over the final 15 minutes of the game for a 3-2 AIK victory. The remainder of the series was all AIK. In front of a rollicking partisan crown at Hovet, AIK built a quick 2-0 lead and then rolled onward to a 4-2 victory in which the home side realized it had LHF reeling and aggressively continued to attack. The series moved back to Luleå for Game 5. Playing as though there was a massive but invisible weight on their shoulders, Luleå looked tentative from the outset. Nevertheless the game stayed scoreless until the middle frame when Oscar Ahlström put AIK on the board with his fourth goal of the series. AIK added some insurance with a Patric Blomdahl power-play goal early in the third period. LHF was simply not up to the task of trying to mount a comeback against Fasth (31-save shutout). When AIK tacked on a shorthanded, empty-net goal in the waning seconds to forge a 3-0 lead, the series was over. AIK will now play Skellefteå in the semifinals, after SAIK defeated Modo in six hard-fought games. Once again, AIK is the underdog, but it is a role that they've grown accustomed to and are fond of playing. As with Luleå, SAIK defeated AIK in four of five regular-season meetings. "Skellefteå plays quite a bit like us and they have good speed," AIK defenseman Fredrik Carlsson told the team's official Web site. "It's going to be a very up-tempo semifinal … but we have a good chance to win the series." As things turned out in the five-game victory over Luleå, AIK did not need (or receive) much production from its top two regular-season scorers: Gynge was blanked for the entire series and prolific playmaker Rosen generated just two helpers. Instead, 11 different AIK players scored at least one goal in the quarterfinals, and the primary slack was picked by Ahlström (4 goals), Kent McDonell (2 goals, 2 assists), winger Johannes Salmonsson (1 goal, 3 assists) and center Oscar Steen (4 assists). Fasth stopped pucks at a 94.2 percent clip and posted a 1.81 goals-against average in the opening series. Moving forward, AIK is going to need more from Rosen and Gynge to overcome SAIK. Skellefteå's speed was ultimately too much for a game Modo to handle, and emerging star goaltender Joacim Eriksson (1.31 GAA, .956 save percentage) was extremely sharp during the first round while the Luleå duo of Johan Gustafsson and David Rautio faltered after their strong regular season showings. The other semifinal series will be conducted between the winners of the HV 71-Färjestad and Brynäs-Frölunda series. Sixth-seeded Färjestad and fourth-place Brynäs currently hold 3-games-to-2 advantages in their respective quarterfinal rounds, with both teams looking to wrap up their series on Wednesday.